Family owned and operated with five locations around the Puget Sound to serve you. The traditional decor and family friendly environments are an ideal place to celebrate special occasions or enjoy a casual lunch or dinner. 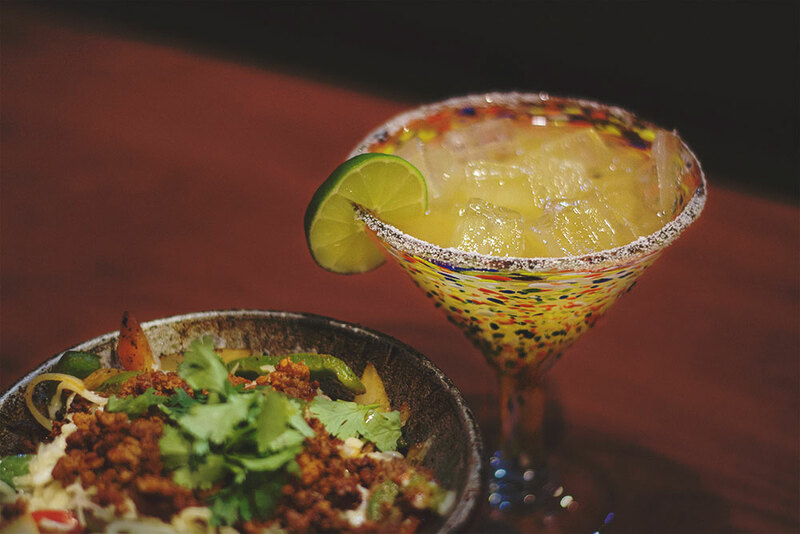 Each location offers full service cantinas to wet the tongue with some of the tastiest margaritas and cocktails in town. We value healthy living that's why we use all natural sea salt in our recipes and in our table salt shakers. Our sautéed meats are cooked with vegetable, soybean, and canola oil. As always, complimentary chips and salsa are served with the meals and drinks. 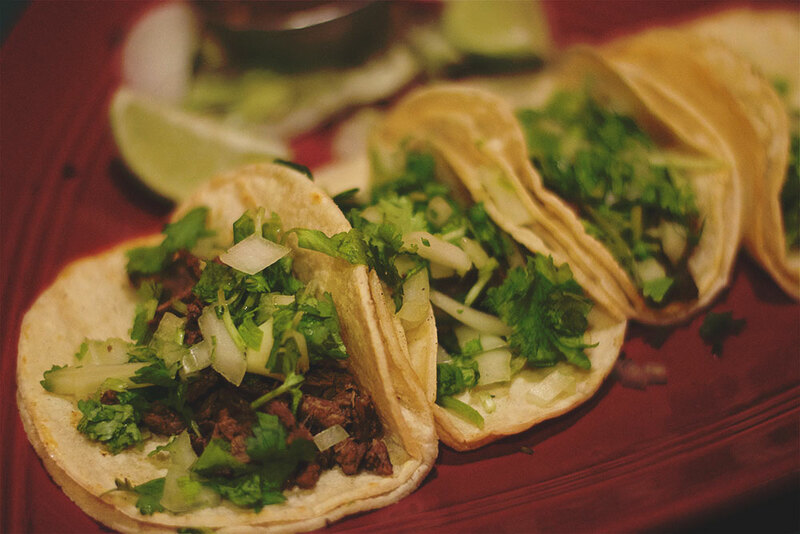 Check out our locations page to see which El Toro is nearest you and come join us today! We do not recommend items that may get soggy for takeout ordering such as Nachos, Taco Salads, hard shell tacos, Mexican pizzas, etc. 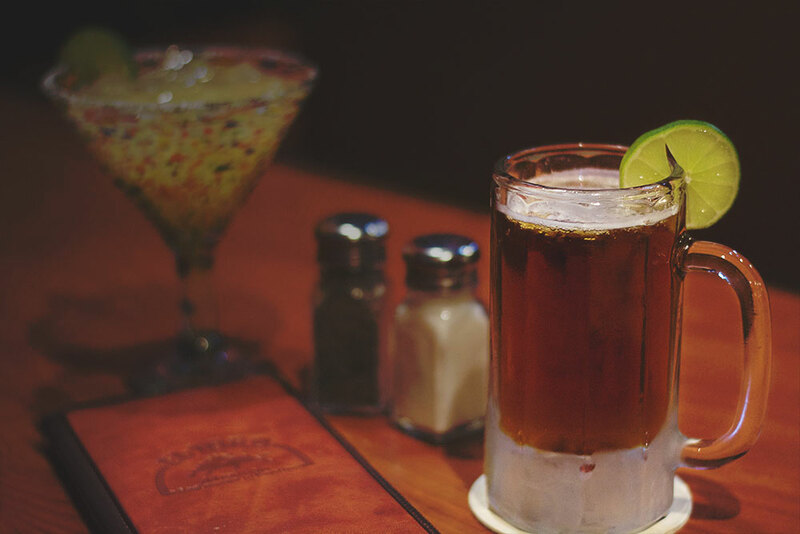 These items are meant to be consumed right away for best enjoyment. We will still prepare them if you wish, however, please know that we will not refund/replace for this. Served with rice, beans and coleslaw. + $.50 for pork or picadillo. 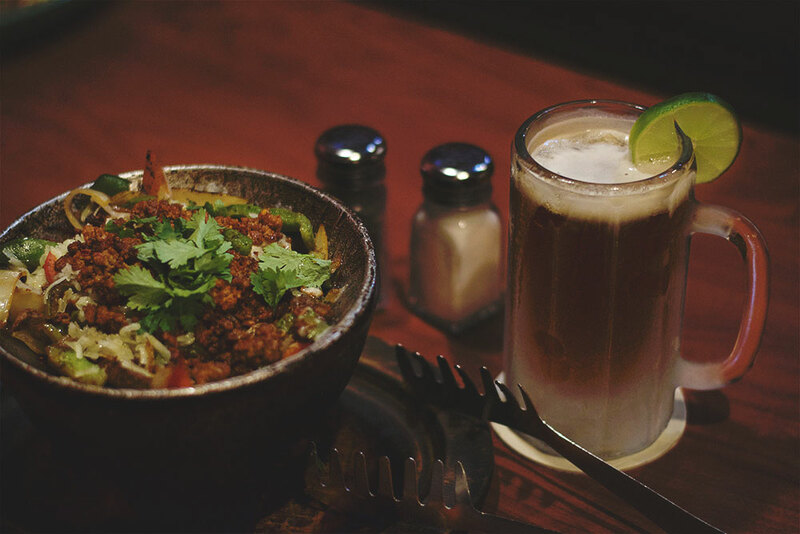 Crispy tortilla bowl layered with beans, chicken or beef, iceberg lettuce, cheddar, sour cream and guacamole, garnished with tomato and salsa roja. Fresh romaine lettuce with grilled chicken, tomato, avocado, and crispy tortilla strips. Caesar dressing and parmesan. Fresh romaine lettuce, grilled marinated chicken, avocado, corn, roasted pepita squash seeds, crispy tortilla strips, black beans, queso fresco and tomatoes. Served with our chipotle dressing. 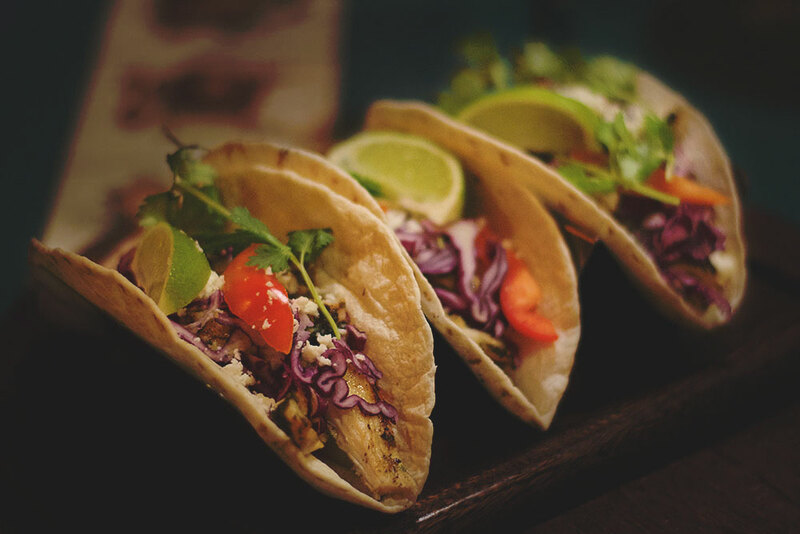 Crispy corn tortillas layered with refried beans, iceberg lettuce, dry shredded chicken, cheddar, tomato and avocado. Served with Italian dressing and parmesan. Rolled flour tortillas filled with your selection. Refried beans, rice, chicken or ground beef. Topped with guacamole, chopped onions, tomatoes, salsa roja and parmesan. Pork sirloin cooked in tasty tomatillo. Covered in verde sauce and melted cheese. With rice and beans. Refried beans, rice, chicken or ground beef. Topped with salsa roja, melted cheese, iceberg lettuce, sour cream and diced tomatoes. Diced carne asada and pinto beans. Covered with salsa roja or verde and melted cheese. With rice, pico de gallo and sour cream. Strips of steak or chicken sautéed with bell peppers, onions and tomatoes. Topped with salsa roja and melted cheese. With rice, beans and pico de gallo. Crispy rolled flour tortilla filled with chicken or ground beef, mounted with iceberg lettuce, cheddar, diced tomatoes, guacamole, sour cream and salsa roja. Crispy flour (2) or corn (4) tortillas rolled with chicken or ground beef. Topped with salsa roja and parmesan. With sour cream and guacamole. Two enchiladas filled with shredded chicken, covered with monterey jack and our salsa de mole made with four varieties of sweet peppers, mexican chocolate, ground almonds, and raisins. Two enchiladas filled with your choice of chicken, ground beef or cheese. Topped with salsa verde and sour cream. Served with rice, beans. + $.50 for pork or picadillo. Giant flour tortilla, melted cheeses, chicken or ground beef, diced onions, tomatoes and jalapeños. Served with sour cream and guacamole. Giant wheat tortilla, steak or chicken fajita melted monterey Jack, sautéed bell peppers, jalapeños, onions and tomatoes. Served with sour cream and guacamole. Giant wheat tortilla, diced skirt steak, melted cheeses, sautéed onions and mushrooms, pico de gallo, and jalapeños. Served with sour cream and guacamole. Giant flour tortilla, melted monterey Jack and Cheddar, sautéed spinach and mushrooms, diced onions, tomatoes and jalapeños. Served with sour cream and guacamole. Strips of chicken breast sautéed with onions and mushrooms in a dairy-based sauce with a hint of mustard and spinach. Six ounces of thinly cut skirt steak charcoal broiled to your taste. Garnished with sautéed onions and tomatoes. Served with pico de gallo and guacamole. 1 flour or 2 corn tortillas sauced, grilled, then stuffed with marinated chicken breast and pico de gallo. Topped with parmesan and tomato. Served with guacamole. Crispy flour tortilla, refried beans, chicken or ground beef, melted cheese, tomatoes, jalapeños, sour cream, and guacamole. Hand crafted in house by our chef. Poblano pepper stuffed with cheese, battered, lightly crisped, covered in salsa roja and drizzled with crema. Crispy flour (4) or corn (6) tortillas rolled with chicken or ground beef. Sour cream and guacamole, splashed with salsa roja, and sprinkled with parmesan cheese. Our sampler that includes flautas, a quesadilla, and nachos. Chicken or ground beef. Sour cream and guacamole. Crispy home made chips covered with beans, melted cheese, jalapeños and tomatoes. Chicken or beef. Sour cream and guacamole. Giant flour tortilla filled with melted cheese, diced onions, tomatoes, jalapeños and chicken or ground beef. Sour cream and guacamole. Delicious mexican cheese dip with peppers, onion and spices. Crispy tortilla shell with marinated chicken breast, beans, iceberg lettuce, bell peppers, onion, avocado, tomatoes, and cheddar. Pico de Gallo. Traditional Mexican soup which includes beef tripe. Only for the connoisseur. With Tortillas. Traditional Mexican soup with chile California, chile chipotle, chicken, avocado, parmesan, tortilla strips, onion, and spices. Served with rice, beans and coleslaw. Two rolled corn tortillas stuffed with baby spinach, diced onions and tomatoes, topped with monterey jack and salsa verde. Two enchiladas filled with your choice of chicken, ground beef or cheese. Topped with salsa verde and drizzled with mexican crema. Three enchiladas traditionally colored. Enchilada verde filled with picadillo, enchilada blanca filled with cheese, and enchilada de mole filled with chicken. Served with rice, beans, coleslaw and tortillas. Top sirloin strips seasoned and sautéed with bell peppers, mushrooms, onions and tomatoes. Six ounces of carne asada and a full order of shrimp sautéed with onions, and mushrooms. Served with pico de gallo. Ten ounces of thinly cut skirt steak charcoal broiled to your taste. Garnished with sautéed onions and tomatoes. Served with pico de gallo and guacamole. Beef sirloin cooked in our red chile pasilla based colorado sauce. 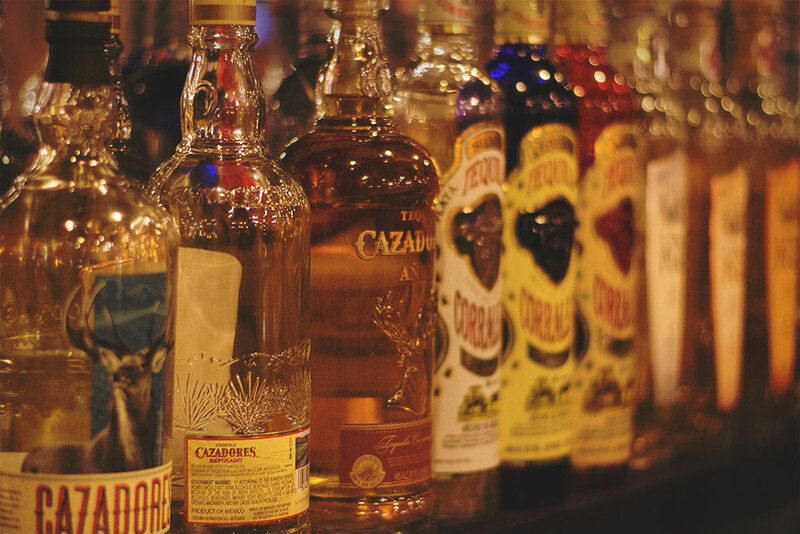 Mexico's favorites: Six ounces of Carne Asada, an authentic chile relleno drizzled with crema, and enchilada de mole. Pork sirloin cooked and served in a delicious tomatillo chile sauce. With Tortillas. 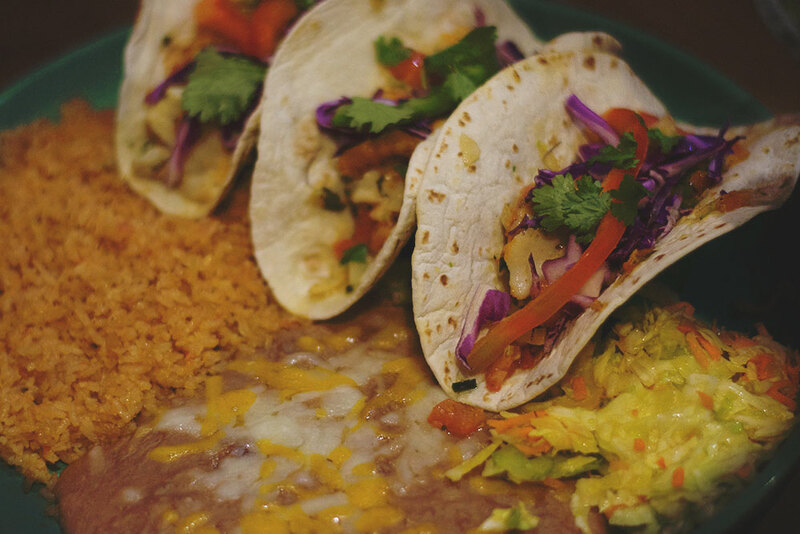 Our signature platter includes an enchilada, taco, chile relleno, and burrito. Chicken, ground beef or cheese. 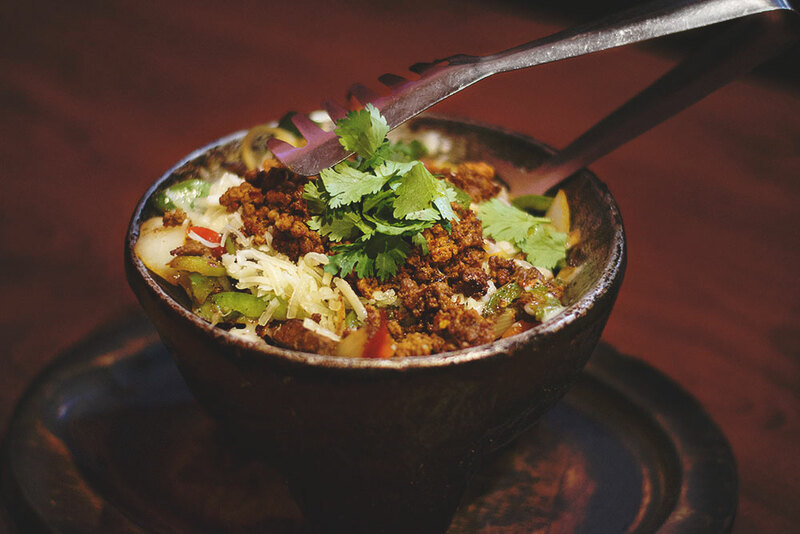 A cultured stone bowl filled with strips of chicken breast, bell peppers, onions and chorizo. Covered in monterey jack. With pico de gallo, sour cream, guacamole and tortillas. Chile verde, chile colorado and our authentic chile relleno are all featured here! With tortillas. Crispy flour (4) or corn (6) tortillas rolled with chicken or ground beef. Topped with salsa roja and parmesan. With sour cream and guacamole. 2 flour or 3 corn tortillas sauced, grilled, and stuffed with marinated chicken breast and pico de gallo. Topped with parmesan and tomato. Served with guacamole. Slow cooked, delicious, slightly shredded with tortillas. Giant rolled flour tortillas filled with your selection. Served with coleslaw. Strips of chicken breast sautéed with bell peppers, onions and tomatoes. Topped with salsa roja and melted cheese. With rice, beans and pico de gallo. Beef sirloin cooked in chile pasilla sauce. Covered with the pasilla sauce and melted cheese. With rice and beans. Strips of chicken breast seasoned and sautéed with bell peppers, mushrooms, onions and tomatoes. Strips of chicken breast cooked with our special mole sauce created with four varieties of sweet dry peppers, Mexican chocolate, ground almonds and raisins. 3 flour tortillas filled with grilled chicken breast marinated with lime juice, cilantto, garlic and various spices. With red cabbage, bell peppers, queso fresco and served with a creamy chipotle sauce. Jumbo prawns sautéed with mushrooms and onions and served in a creamy dairy based sauce with a hint of mustard and spinach. Three flour tortillas neatly filled with marinated fish and shredded cabbage. Garnished with fresh cilantro and lime. Served on a sizzling skillet, with sautéed bell peppers and onions, topped with diced tomato. Served with rice, beans, pico de gallo, coleslaw, sour cream, guacamole and tortillas. Served with rice, beans and coleslaw. + $.50 for pork or picadillo. Choose flour or wheat tortilla. Giant tortilla, steak or chicken fajita melted monterey Jack, sautéed bell peppers, jalapeños, onions and tomatoes. Served with sour cream and guacamole. Giant tortilla, diced skirt steak, melted cheeses, sautéed onions and mushrooms, pico de gallo, and jalapeños. Served with sour cream and guacamole. Giant tortilla, melted monterey Jack and Cheddar, sautéed spinach and mushrooms, diced onions, tomatoes and jalapeños. Served with sour cream and guacamole. Slightly shredded slow cooked pork. Seniors age 65+ & children under 12. Served with rice and beans. + $.50 for pork or picadillo. Seven garlic prawns sautéed with mushrooms and onions. Seven bacon wrapped prawns topped with melted cheese. carne asada ($5), pollo asado, chorizo, or adobada. Enjoy our spiced up cheese dip. Six chicken wings with veggies and dipping sauce. Enjoy our complimentary chips and salsa. Fill out the form below regarding questions, concerns, and we will get in touch with you! At this time we do not offer on site catering. We do offer large quantity take out orders. For reservations small or large please call the location. This form does not handle these requests. Please select location you are contacting about. Please fill out the questionnaire below/Favor de responder abajo. What days and times are you available to work? When can you start to work? List previous employers to call for a reference about you, beginning with the most recent first. Do you have reliable transportation for all hours of the day? Anything you would like to say or add? Which location are you applying for? Thank you! The way this works is that your inquiry will be filed in it's relevant position folder. When any of our managers are looking to hire they will look into these files and will select for interview. There is no time frame, you could be called today or in weeks, or maybe not at all. Good luck and maybe see you here! 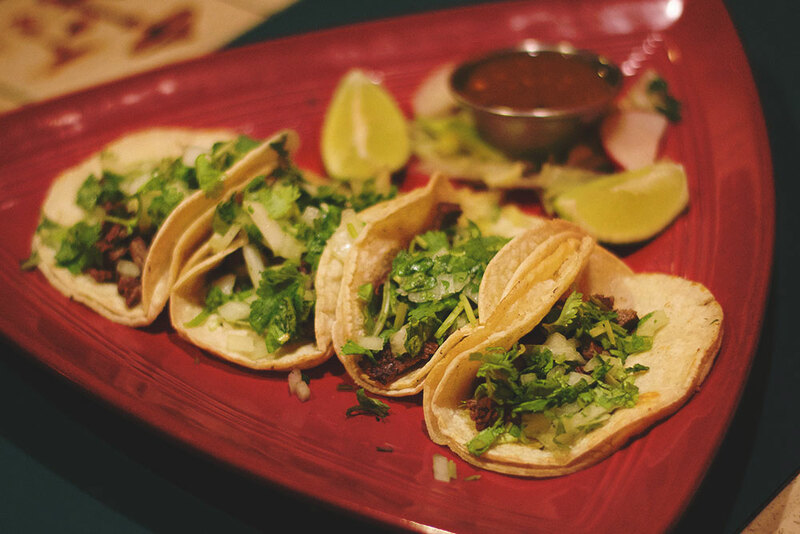 El Toro Mexican Restaurant & Cantina © 2015 | eltorofamily.com | All Rights Reserved.